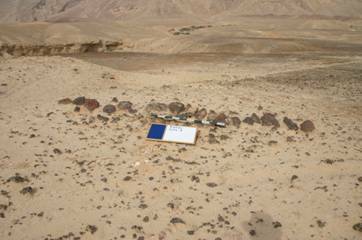 In 2004, accommodating a proposal by the Rotem Emprat Negev Corporation to extend their mining operation in the Nahal Gov area of the Negev Desert, the Israel Antiquities Authority located a variety of archaeological sites within the impact area. Y.G. 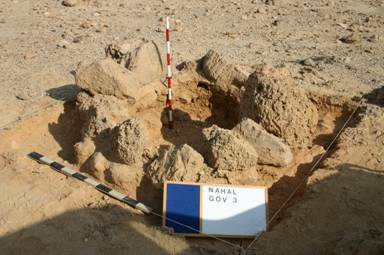 Contract Archaeology won the tender to investigate, and company executive Yehuda Govrin directed the subsequent project which was carried out in November 2004. We investigated nine archaeological sites. Six were circular or elliptical features, built of stone (top pictures). We excavated their interiors and exteriors, but found no artifacts or other evidence that might have shed light on the function or meaning of these curious remains. Three other stone features were linear in form. It is our interpretation that these were navigational aids.